For the San Diego Chargers linebacker, see Bobby Lane. Robert Lawrence Layne (December 19, 1926 – December 1, 1986) was an American football quarterback who played for 15 seasons in the National Football League. He played for the Chicago Bears in 1948, the New York Bulldogs in 1949, the Detroit Lions from 1950–1958, and the Pittsburgh Steelers from 1958–1962. Layne was selected by the Bears with the third overall pick of the 1948 NFL draft. He played college football at the University of Texas. Layne was inducted into the Pro Football Hall of Fame in 1967 and the College Football Hall of Fame in 1968. His number, 22, has been retired by the University of Texas Longhorns and Detroit Lions. 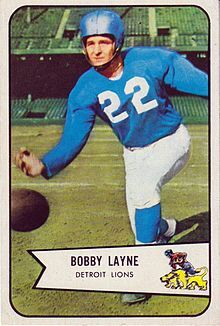 6 "Curse of Bobby Layne"
Born in Santa Anna, Texas, Layne's family moved when he was very young to Fort Worth, where he attended elementary and junior high school. His mother died when he was only eight years old, and Layne moved in with his uncle and aunt, Mr. and Mrs. Wade Hampton. He attended Highland Park High School in University Park, where he was a teammate of fellow future hall of famer Doak Walker, the Heisman Trophy winner in 1948 for the SMU Mustangs and a pro teammate with the Detroit Lions. In his senior year, Layne was named to the all-state football team, played in the Oil Bowl All-Star game, and led Highland Park to the state playoffs. One of the most successful quarterbacks ever to play for Texas, Layne was selected to four straight All-Southwest Conference teams from 1944–47, and was a consensus All-American in his senior year. World War II caused a shortage of players, and rules were changed to allow freshmen to play on the varsity, thereby allowing Layne a four-year career. Freshman play was sporadically allowed by various conferences during wartime, but would not be allowed universally until the rules were permanently changed in 1972. In his freshman season, Layne became a very rare player (in that era) to start his first game. He missed his second game due to an injury and was replaced by future North Texas transfer Zeke Martin, but Layne played the rest of the season and led the Longhorns to within one point of the Southwest Conference Championship when they lost to TCU 7–6 on a missed extra point. Prior to and during his sophomore year, he spent eight months in the Merchant Marines, serving with his friend Doak Walker. He missed the first six games of the season, and was replaced by Jack Halfpenny. The last game he missed was the team's only loss, to Rice, by one point. Texas went 10–1, won the Southwest Conference, and despite playing only half a season, Layne again made the all-conference team. In the Cotton Bowl Classic following that season, Texas beat Missouri 40–27, and Layne played perhaps the best game of his career. He set several NCAA and Cotton Bowl records that have lasted into the 21st century. In that game, he completed 11 of 12 passes and accounted for every one of the team's 40 points, scoring four touchdowns, kicking four extra points, and throwing for two other scores, thus he was named one of the game's outstanding players. In 1946, the Longhorns were ranked number one in the preseason for the first time, but after beating number 20 Arkansas, they were upset by number 16 Rice and later by unranked TCU. They went 8–2, finished third in the conference, ranked number 15 nationally, and missed out on any bowl games. Layne led the Southwest Conference in total offense (1420 yards), total passing (1115 yards), and punting average(42 yards). Despite the unexpected finish, Layne was named All-Conference again and finished eighth in Heisman Trophy balloting to Glenn Davis of Army. In 1947, Blair Cherry replaced Dana X. Bible as head coach at Texas and he decided to install the T-formation offense. Cherry, Layne, and their wives spent several weeks in Wisconsin studying the new offense at the training camps of the Chicago Bears and Chicago Cardinals of the National Football League. The change was a success, as Layne led the Southwest Conference in passing yards, made the All-Conference and All-American teams, and finished sixth in Heisman Trophy voting to John Lujack of Notre Dame. The Longhorns, after beating number-19 North Carolina, started the season ranked number 3. They then beat number-15 Oklahoma, but as happened in 1945, Texas was again denied an undefeated season by a missed extra point. After coming back once against Walker's number-8 SMU, Texas again found itself behind late in the game. Layne engineered a fourth-quarter touchdown drive that would have tied the game, but kicker Frank Guess pushed the extra point wide and the Longhorns lost 14–13. They fell to eighth, and finished behind SMU in the Southwest Conference, but gained an invitation to the Sugar Bowl, where Layne and the Longhorns beat number-six Alabama. As a result of his 10-24, 183 yard performance, Layne won the inaugural Miller-Digby award presented to the game's most valuable player. The Longhorns finished ranked fifth, the best finish in Layne's career. Layne finished his Texas career with a school-record 3,145 passing yards on 210 completions and 400 attempts and 28 wins. Layne was one of the first inductees into the Cotton Bowl Hall of Fame and made the Cotton Bowl's All-Decade team (1937–1949) for the 1940s. Later, both of Layne's sons, Rob and Alan, played college football. Robert L. Layne, Jr., was a kicker for Texas, playing on the 1969 National Championship team, and Alan played tight end for Texas Christian in 1973. Layne was one of the best pitchers to ever play at Texas. He made the All-Southwest Conference team all four years he played, and played on teams that won all three Conference Championships available to them (none was named in 1944 due to World War II). He won his first career start, in 1944, when he was managed by his future football coach Blair Cherry, versus Southwestern, 14-1, in a complete-game, 15-strikeout performance. Similar to football, he missed the 1945 season because he was in the Merchant Marines, but returned to play three more seasons. In 1946, he threw the school's first and second no-hitters and posted a 12-4 record. In 1947, he went 12-1 and led Texas to a third-place finish in the first NCAA baseball Tournament. In 1948, he went 9-0 and again helped Texas win the Southwest Conference, but though they qualified for it, Texas decided not to attend the 1948 NCAA tournament because the players felt they had too many obligations with family and jobs. Texas went 60-10 overall, and 41-2 in the SWC during Layne's final three years in Austin. When his career was over, Layne had a perfect 28-0 conference record and set several school and conference records during his time on the team, including a few that still stand today. Between baseball and football, he was All-Conference an astounding eight times and won four conference championships. In 1948, after earning his degree in physical education, Layne played a season of minor league ball for the Lubbock Hubbers baseball team of the Class C West Texas–New Mexico League. He went 6-5 with a 7.29 ERA, and had bids from the New York Giants, the Boston Red Sox, and the St. Louis Cardinals to join their staffs, but he preferred to go to the National Football League, where he could play immediately rather than grind out several years in the minor-league system. Drafted into the National Football League by the Pittsburgh Steelers, Layne was the third overall selection in the 1948 NFL Draft and was the second overall selection in the 1948 All-America Football Conference (AAFC) draft by the Baltimore Colts. Layne did not want to play for the Steelers, the last team in the NFL to use the single-wing formation, so his rights were quickly traded to the Chicago Bears. He was offered $77,000 to play for the Colts, but George Halas "sweet talked" him into signing with the Bears. He promised a slow rise to fame in the "big leagues" with a no-trade understanding. After one season with the Bears, during which Layne was the third-string quarterback behind both Sid Luckman and Johnny Lujack, Layne refused to return and tried to engineer his own trade to the Green Bay Packers. Halas, preoccupied with fending off a challenge from the AAFC, traded Layne to the New York Bulldogs for their first-round pick in the 1950 draft and $50,000 cash. The cash was to be paid in four installments. With Layne at quarterback, the Bulldogs won only one game and lost 11, but Layne played well and developed quickly. Layne compared one season with the soon-to-be-defunct New York Bulldogs as worth five seasons with any other NFL team. In 1950, he was traded to the Detroit Lions for wide receiver Bob Mann, and the Lions agreed to make the final three payments to Halas (Halas later remarked that the Lions should have continued the yearly payments indefinitely to him in view of Layne's performance). For the next five years, Layne was reunited with his great friend and Highland Park High School teammate Doak Walker, and together they helped make Detroit into a champion. In 1952, Layne led the Lions to their first NFL Championship in 17 years, and then did so again in 1953 for back-to-back league titles. They fell short of a three-peat in 1954 when they lost 56–10 to Cleveland Browns in the NFL championship game, a loss which Layne explained by saying, "I slept too much last night." In 1955, the team finished last in their conference and Walker surprisingly retired at the top of his game. As Walker had been the team's kicker, Layne took over the kicking duties in 1956 and 1957, and in 1956 led the league in field goal accuracy. In 1956, the Lions finished second in the conference, missing the championship game by only one point. In 1957, the season of the Lions' most recent NFL championship, Layne broke his leg in three places in a pileup during the 11th game of the 12-game season. His replacement, Tobin Rote, finished the season and led the Lions to victory in the championship game in Detroit, a 59-14 rout of the Cleveland Browns. After the second game of the 1958 season, Pittsburgh Steelers coach Buddy Parker, formerly in Detroit, arranged a trade on October 6 that brought Layne to the Steelers. During his eight seasons in Detroit, the Lions won three NFL championships and Layne played in four Pro Bowls, made first team All-Pro twice, and at various times led the league in over a dozen single-season statistical categories. Following the trade, Layne played five seasons with the Pittsburgh Steelers. Though he made the Pro Bowl two more times, he never made it back to the playoffs, and the team's best finish was second in the conference in 1962. During his last year in the NFL, he published his autobiography Always on Sunday. Later he stated that the biggest disappointment in his football career was having never won a championship for the Pittsburgh Steelers and specifically, Art Rooney. By the time Layne retired before the 1963 season, he owned the NFL records for passing attempts (3,700), completions (1,814), touchdowns (196), yards (26,768), and interceptions (243). He left the game as one of the last players to play without a facemask and was credited with creating the two-minute drill. Doak Walker said of him, "Layne never lost a game...time just ran out on him." Following his retirement as a player, Layne served as the quarterback coach for the Pittsburgh Steelers from 1963–65 and the St. Louis Cardinals in 1965. He was a scout for the Dallas Cowboys from 1966–67. He later unsuccessfully sought the head coaching job at Texas Tech, his last professional involvement with the sport. For his on-the-field exploits, Layne was inducted into a vast assortment of halls of fame. These included the Texas Sports Hall of Fame in 1960, the Longhorn Hall of Honor in 1963, the Pro Football Hall of Fame in 1967, the state halls of fame in Michigan and Pennsylvania, and the Texas High School Sports Hall of Fame in 1973. In 2006, he was a finalist on the initial ballot for pre-1947 inductees to the College Baseball Hall of Fame. He was a finalist again the following year. In a special issue in 1995, Sports Illustrated called Layne "The Toughest Quarterback Who Ever Lived." In 1999, he was ranked number 52 on the Sporting News' list of Football's 100 Greatest Players. After retirement, Layne spent 24 years as a businessman back in Texas in Lubbock, working with his old college coach, Blair Cherry. His business ventures included farms, bowling alleys, real estate, oil, and the stock market. In his younger days, he, often accompanied by Alex Karras, was well known for his late-night bar-hopping and heavy drinking and it was said of him, "He would drink six days a week and play football on Sunday"; but his heavy drinking may have contributed to his death. Layne is reported to have stated: "If I'd known I was gonna live this long, I'd have taken a lot better care of myself." That line was later used by baseball legend Mickey Mantle, a Dallas neighbor and friend of Layne's, who also died in part due to decades of alcohol abuse. Layne suffered from cancer during his last years. In November 1986, he traveled to Michigan to present the Hall of Fame ring and plaque to his old friend and teammate Doak Walker, but was hospitalized with intestinal bleeding in Pontiac after a reunion dinner with his former Detroit teammates. He returned to Lubbock on November 12, but three days later was hospitalized again. He died in cardiac arrest on December 1 in Lubbock, and was buried there. Doak Walker and three other members of the Pro Football Hall of Fame were among the pallbearers. "My only request", he once said, "is that I draw my last dollar and my last breath at precisely the same instant." In 1958, the Lions traded Layne to the Pittsburgh Steelers. Layne responded to the trade by supposedly saying that the Lions would "not win for 50 years". This story has been called a hoax, particularly because the quote was never published at the time. Coincidentally, in the 2009 NFL Draft, right after the curse supposedly expired, the Detroit Lions drafted University of Georgia quarterback Matthew Stafford first overall. Stafford was an alumnus of Layne's former school Highland Park High School and also lived in a house on the same street as Layne's. In the 2011 season, Stafford's first full injury-free season, he led the Lions to their first playoff berth since 1999, but lost to fellow Texan Drew Brees and the New Orleans Saints. Also, in the 60 years since the curse, the Lions also endured multiple playoff droughts lasting more than 6 years, including the year of the trade, the Lions did not make the playoffs in 12 consecutive seasons. (1958–1969; 1984–1990; 1971–1981; 2000–2010). ^ a b c d e f g h Kohou, Martin Donell. "Layne, Robert Lawrence". tshaonline.org. Retrieved May 25, 2017. ^ Lucksinger, Ross. "The History of Freshman Quarterbacks at Texas". insidetexas.com. Retrieved May 25, 2017. ^ "Texas-Oklahoma classic to be played Saturday in Dallas". Abilene Reporter-News. October 10, 1944. Retrieved May 25, 2017. ^ "One Man, All 40 Points". goldenrankings.com. Retrieved August 7, 2013. ^ "Bobby Layne Chalks Up Three SWC Titles". Lubbock Morning Avalanche. December 3, 1946. Retrieved March 13, 2015. ^ "1946 Heisman Trophy Voting". sports-reference.com. Archived from the original on January 21, 2015. Retrieved January 21, 2015. ^ "SMU's Greatest Moments #21". smumustangs.com. Archived from the original on December 21, 2014. Retrieved January 22, 2015. ^ "14th Annual Sugar Bowl Classic". allstatesugarbowl.org. January 1, 1948. Retrieved January 22, 2015. ^ a b "2006 Official College Baseball Foundation Hall of Fame Ballot" (PDF). lsusports.net. Retrieved January 29, 2015. ^ Madden, W.C.; Stewart, Patrick J. (January 1, 2004). The College World Series: A Baseball History, 1947–2003. McFarland. p. 11. ISBN 0786418427. ^ Guzzardi, Joe (February 5, 2011). "Bobby Layne: The NFL Hall of Fame Great Who Could Have Starred in the Major League". Retrieved January 30, 2015. ^ a b c d e Nassar, Taylor. "Layne, Robert Lawrence". libraries.psu.edu. Archived from the original on May 15, 2013. Retrieved January 23, 2015. ^ Collier, Gene (April 23, 2006). "Making a pitch for Bobby Layne for baseball hall". Retrieved January 29, 2015. ^ Livingston, Pat (October 7, 1958). "Layne takes over as Steeler QB". Pittsburgh Press. p. 27. ^ Sell, Jack (October 7, 1958). "Steelers get Layne for Morrall". Pittsburgh Post-Gazette. ^ Cavanaugh, Jack (2008). Giants Among Men. Random House. p. 129. ISBN 978-1-4000-6717-6. ^ a b c Harvey, Randy (December 2, 1986). "Football Legend Layne Dies at 59 of Heart Failure". Los Angeles Times. Retrieved January 27, 2015. ^ a b "Longhorn MVPs/Hall of Famers" (PDF). Archived from the original (PDF) on November 25, 2015. ^ a b "Famed Quarterback Bobby Layne Dies". Pittsburgh Post-Gazette. December 2, 1986. Retrieved January 30, 2015. ^ "COLLEGE BASEBALL HALL OF FAME ANNOUNCES OFFICIAL 2007 NOMINEE BALLOT" (PDF). Retrieved May 25, 2017. ^ "Sporting News' Football's 100 Greatest Players". Archived from the original on May 16, 2008. Retrieved May 25, 2017. ^ "Bobby Layne remains in critical condition". Sarasota Herald-Tribune. Florida. Associated Press. November 21, 1986. p. 8C. ^ "Famed quarterback Booby Layne dies". Pittsburgh-Post Gazette. December 2, 1986. p. 8. ^ "500 attend funeral for Bobby Layne". Ottawa Citizen. Canada. UPI. December 4, 1986. p. B6. ^ "Friends eulogize Layne". Ludington Daily News. Michigan. Associated Press. December 4, 1986. p. 10. ^ King, Peter (March 2, 2009). "Searching For Bobby Layne". Sports Illustrated. Retrieved November 25, 2010. ^ Rogers, Justin (March 7, 2009). "Turns out the Curse of Bobby Layne is probably a myth". MLive.com. Retrieved November 25, 2010. ^ Seifert, Kevin (July 27, 2009). "Black and Blue all over: Offseason's final week". ESPN.com. Retrieved November 25, 2010. This page was last edited on 11 April 2019, at 13:33 (UTC).